A leading marine scientist has welcomed news that government legislation on charges for plastic bags has led to a substantial reduction in their use. Richard Thompson, Professor of Marine Biology at Plymouth University, has been studying the effects of plastic litter on the marine environment for over 20 years, and his work has informed policies on plastic bag legislation in the UK, Europe, Australia and United States. He said figures released by supermarket giant Tesco – showing a 78 per cent reduction in plastic bag use – demonstrate a growing realisation that short term use of plastic items can be avoided. However, on its own he said the bag tax would not solve the problem of plastic litter in the environment and that to achieve this, manufacturers also need to look at the items taken home in our shopping bags and establish a wider range of ways to reduce the accumulation of packaging waste. This would require designing to maximise recyclability as well as reusability, coupled with consumer education to promote responsible disposal of end-of-life plastics. The 5p levy was introduced by the government at the beginning of October, in an attempt to reduce the use of single-use carrier bags and the litter they can cause. Over the past decade, Professor Thompson has published dozens of papers on plastic debris in the environment; including work demonstrating that plastic bags are slow to degrade in the sea, can be harmful to wildlife and affect marine habitats compromising ecosystem services. 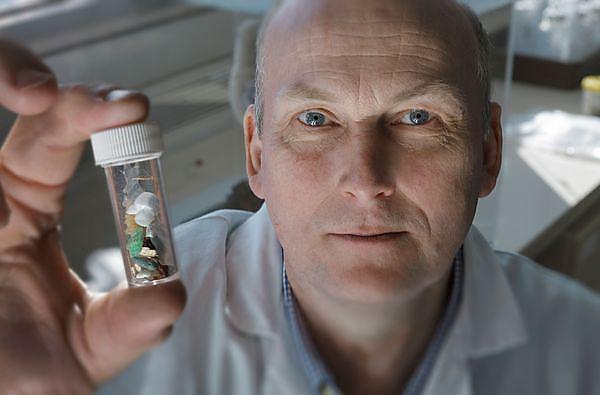 His research has also shown that in the environment plastic items, including bags, can fragment into millions of tiny particles – which he and colleagues refer to as ‘microplastics’ – which can be ingested by a range of organisms, potentially damaging them.